Fields of vines and rapeseed in Rheingau. Rheingau is one of the most historically significant wine-producing regions in Germany. Situated along the Rhine River just west of Frankfurt, the region is characterised by hilly landscapes, castles, monasteries and picturesque towns (the most famous of which is Rüdesheim am Rhein (a fairy-tale like historic town in the heart of the Rheingau), one of Germany’s biggest tourist attractions. The cultivation of vines is believed to have begun during the Roman times but it wasn’t until the Cisternians settled in the area in the 12th century that wine-making became an important economic activity. 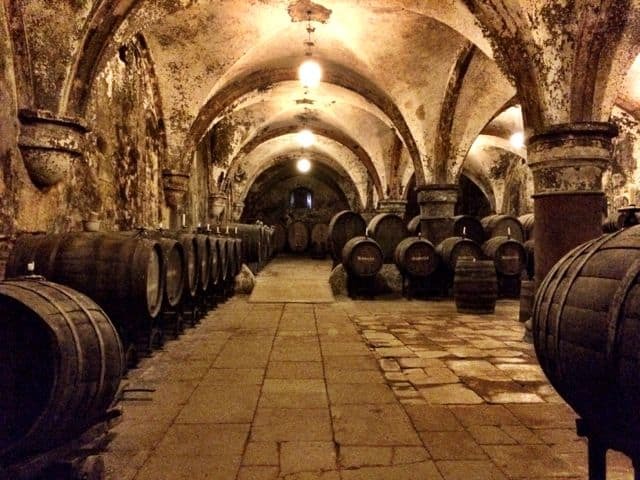 The history of wine-making in the Rheingau can easily be traced through to this day, with important sites like the Eberbach Abbey and Schloss Johannisberg (one of the region’s premier wineries) as testimonials to a rich history of wines and trade. These days, the Rheingau is a major producer of the Riesling variety – about 80% of the wine production is Riesling whilst the rest consists of Pinot Noir or Spätburgunder (believed to have been brought to the region from France by the Cisternians) and Müller-Thurgau. A historic map of Rheingau – taken at the Schloss Johannisberg. I spent a wonderful day touring the Rheingau with my friends Rachelle and Ann, and accompanied by our terrific guide, Walter. I had a good laugh when Walter introduced himself. His surname Schönleber directly translates as ‘beautiful liver’, a reference perhaps to the lifestyle in Rheingau which I was about to discover! Walter originates from Rheingau and operates a tour company called Schönleber 1848. Together, we drove around the hills of Rheingau past endless fields of rapeseed in full bloom, vineyards and gorgeous villages, stopping every so often to enjoy the stunning vistas of the hills and the Rhine valley. It was a beautiful sunny day and the Rheingau looked absolutely resplendent. Fields of rapeseed in full bloom in Rheingau. Rheingau super-selfie, with (left to right) me, Walter, Rachelle and Ann. Our first stop was the historic 12th century Eberbach Abbey. Built by the Cisternians, the abbey was a centre of immense influence and wealth in the 14th/15th centuries. Surrounded by lush forests, the abbey is an impressive site that shouldn’t be missed. The ancient wine-presses were especially awe-inspiring. The abbey was also one of the locations used to shoot the movie “The Name of the Rose”, a medieval thriller starring Sean Connery. 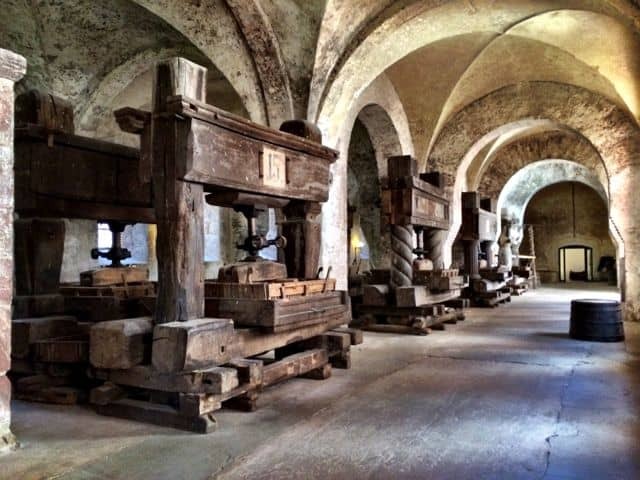 The historic wine presses at the Eberbach Abbey. The impressive wine celler at the Eberbach Abbey. It was immediately obvious that Walter was a walking Wikipedia when it comes to the Rheingau! I loved how he mixed his commentary with amusing anecdotes about the history, culture and people of days bygone. Before we left the abbey, he took us to the abbey’s brewery where we got to taste some of the abbey’s famous brews. From here, we drove down to the Rhine River where we visited the historic 18th century Oestrich crane where the barrels of wine were lifted onto barges for export. It was a gorgeous day and the locals were out and about, strolling or cycling along the banks of the Rhine and stopping for a glass of refreshing Riesling at one of the wine huts along the way. I was beginning to like the Rheingau lifestyle! The Oestrich crane was used to lift barrels of wine onto barges that plied the Rhine River. Rheingau locals enjoying a day out! We spent the rest of the afternoon quizzing Walter about the wines and the history of the Cisternians as he brought us from one winery to the next. Two wineries in particular were absolutely stunning: the Schloss Vollrads, with its beautiful tower, and Schloss Johannisberg. 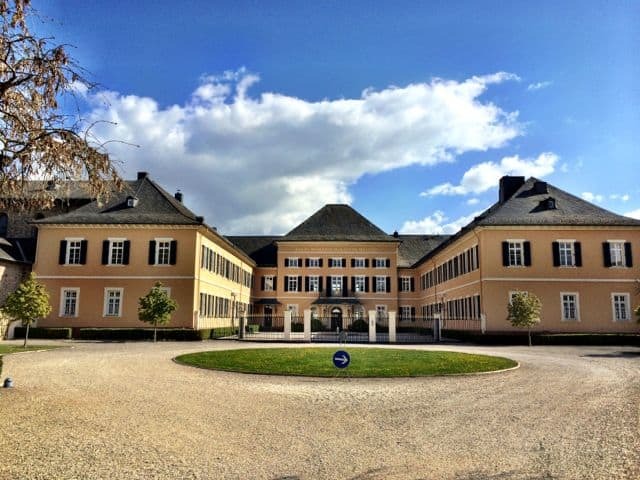 Schloss Johannisberg is particularly significant as it’s the first Riesling wine estate in the world and it was here that the German variety of noble rot was discovered (by accident). The views of the Rhine Valley from Schloss Johannisberg were simply breathtaking. 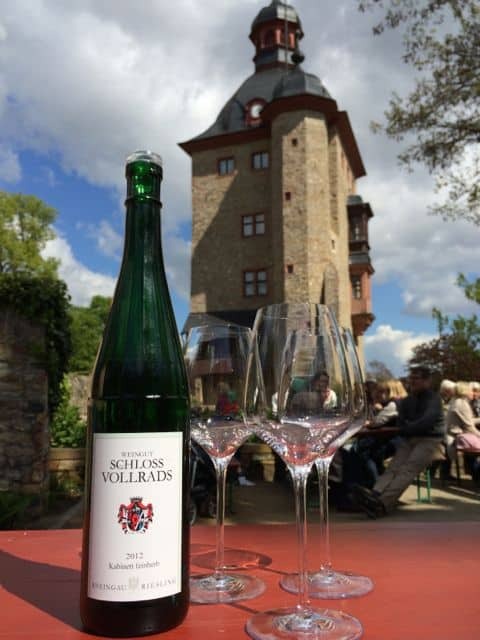 Enjoying a Riesling at Schloss Vollrads. More fabulous Riesling at Schloss Johannisberg! The vineyards at Schloss Johannisberg stretch right up to the banks of the Rhine River. We had a terrific day in Rheingau, thanks to Walter, who wasn’t only a great guide but fabulous company as well (if you’re looking for a guide in Rheingau, Walter’s your man!). The scenery was magnificent and the history and wine in Rheingau made for a memorable trip. A day was simply not enough to see more of Rheingau but as it’s only 4+ hours by train from Amsterdam, I suspect I’ll be back soon! Note: my trip to Rheingau was organised by the German National Tourist Board. As always, all views expressed above are mine. I did not know that Germany produces so much wine. As for the quality, no doubt. Related to Cistercians, in Romania we have an impressive church in Carta village. In the end all cultures and connected in some way! Didn’t honestly know that Germany had a wine industry … thanks for bringing it to my attention! That vineyard with the ‘chateaux’ was my fave! Thank you so much for spotting the error and letting me know. I’ve corrected it. the Rheingau is not situated North of Frankfurt; it is definitely West of Frankfurt. Such grand buildings, steeped with history. And how fitting Walter’s name translation – that’s gold! Beautiful pics – I especially love the old wine presses. Cheers for sharing. That wine cellar is amazing! Looks like a great spot to taste some wine. Having just returned from Bordeaux, I can relate to this experience in the vineyards along the Rhine. Loved Walter’s last name, translated of course, it made me laugh out loud! So funny! Gorgeous pics too. Don’t you just love the vineyard and the stately chateaux??? Bliss!